Lithuanian sports university is committed to meet the international and national requirements, providing high-quality higher education in sports and related areas; carrying out research and experimental development through effective and efficient quality assurance system based on activity planning, implementation and quality assurance, assessment and continuous improvement. Permanent quality culture values of Lithuanian Sports University are employee sensation of autonomy, internal motivation, excellence, talent and loyalty. In 2012 Lithuanian Sports University (hereinafter – LSU) started to implement internal quality management system. It is a mechanism for the implementation of Strategy of Development of Integrated Activities 2012 – 2017 and to ensure operational efficiency. Quality Management System is approved and monitored by the University Senate. Quality assurance includes LSU implemented procedures, processes and systems which help to ensure and improve study, lifelong learning, sports science and development activities and also its supporting activities quality, defines the sharing of responsibilities, feedback and control processes. 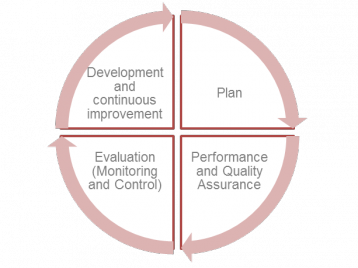 ,,Plan – Do – Check – Act” quality cycle is used in all activity areas of the University to assess progress and identify opportunities for continuous improvement processes. Office of quality management and accreditation provides recommendations on the quality policy and quality objectives, supervise and coordinate the quality management system implementation and improvement. Quality Council – an advisory body of the quality issues. It consists of 10 members – eight members appointed from the academic and non-academic staff, and 2 members appointed by the deans from the student representatives.